﻿ José Mourinho: "I enjoy watching Cristiano Ronaldo playing this way"
19.10.2011 » José Mourinho: "I enjoy watching Cristiano Ronaldo playing this way"
Cristiano Ronaldo didn't score any goal in the last 3 matches, in which Real Madrid striked succesfully for 12 times. A Ronaldo dependency seems to be a long gone idea as the Merengues evolved this season showing better team awareness concepts. Mourinho says he prefers to watch Cristiano Ronaldo performing the way he has been doing. In the last 3 matches Real Madrid have played, Cristiano Ronaldo couldn't find the back of the net, but in contrast to what usually happened last season, the Merengues seem to have found the antidote for a Ronaldo dependency, with 12 goals scored, equitably distributed in those 3 games. In the post-match conference from the clash between Real Madrid and Lyon, José Mourinho said that he isn't worried at all with the lack of goals from Cristiano Ronaldo, since he prefers to watch him playing as he has been in the last weeks, more prone to assist his teammates and more aware of a collective game concept. José Mourinho: "I'm delighted with Cristiano Ronaldo. We could talk about a problem if besides Ronaldo not being able to score, our team couldn't also do it, as it happened against Racing Santander and Levante. In our last matches, he didn't score, but the team found a way to solve the problems. I like watching Cristiano Ronaldo performing intelligently has he has been doing, showing that he also cares about his teammates. Last season he won the "Golden Shoe" and the "Pichichi" award, so who knows if this year he won't be winning the most important ones, which are the team trophies." José Mourinho also showed his unpleasantness in the way the referee conducted the game between Real Madrid and Lyon. The Portuguese coach criticized the double-standard that seems to be evident when judging game situations from either Real Madrid or Barcelona, but he was careful not to mention the rival's name on his statements. Mourinho: "There are teams who are allowed to take free-kicks quickly and they score goals by doing that, because they take advantage of a few opponents players not being in their proper position. However, they don't let us do the same and if necessary, they'll even allow it, if it's against us. When we do it, the referee calls it off and we even get shown a yellow card. Xabi Alonso showed his intelligence by noticing the attacking movement from his teammate and taking the free-kick quickly, but the result of that was a yellow card instead of a goal. Cristiano Ronaldo was another Real Madrid player who got shown the yellow card in the match against Lyon, by tackling an opponent immeaditly after losing the ball. Mourinho: "When we're winning 4-0 and there are only 4 minutes, that's a card we should avoid at all costs. It's a natural reaction when someone loses the ball. We working on these things, to quickly react everytime we lose the ball possession. However, I can tell UEFA that they have no reason to be nervous about it, because we're not going to force our players to be shown yellow cards in the last matches of the group stages. If arrive at that stages with yellow cards, then let it be." Real Madrid will now play against Malaga for La Liga, next Saturday. You may watch Malaga vs Real Madrid streaming, in our Soccer Live Streams section. 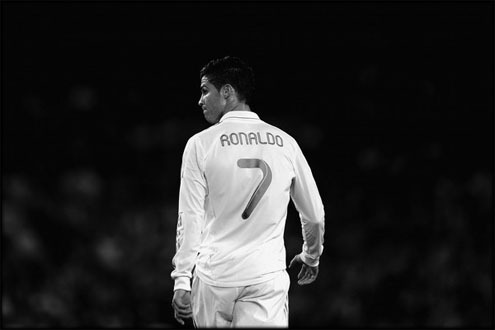 The countdown clock timer, displaying the time left for the next Ronaldo game, is shown on the top right corner of all pages. Besides Real Madrid game, you can also watch Manchester United vs Manchester City live stream this Sunday, but the day before, you may still follow Barcelona vs Sevilla online. All streamings are provided from our "Live" section.